And, as the last entry you will see the society's submitted objection to Sea Lanes, the scheme presented in the August Planning Forum page. This is a hybrid planning application seeking full planning permission for redevelopment of the existing college site (Site A, west side of Pelham Street) and outline permission for demolition of college-owned buildings on the east side of Pelham Street (site B, former York Place elementary schools) for housing. Site B borders Valley Gardens conservation area to the west and North Laine conservation area to the south. 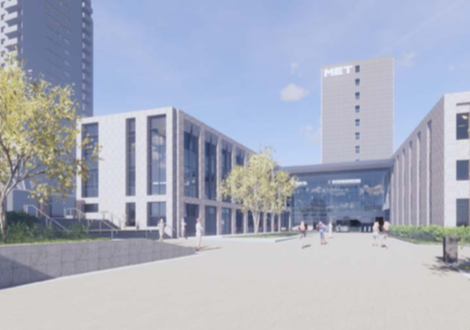 The College seeks to enhance the interior of the existing 11 storey Pelham Tower and increase teaching space by building two three storey extensions adjoining the tower and into the existing car park. A large portion of the car park will given over to landscaped open space, with cycle and some disabled parking. Vehicular access will change. Present car park users will have to find alternate parking. 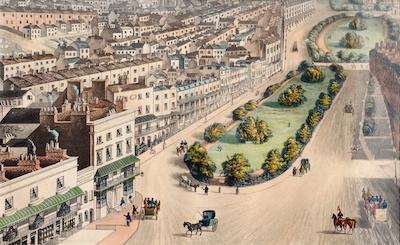 The Regency Society had no major objections to this part of the application but suggested that greater attention be given to maximise improvement of the public realm. 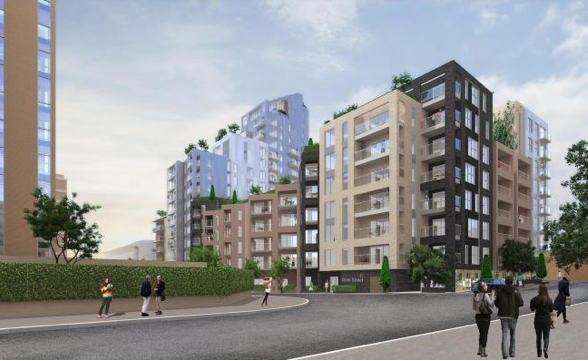 Outline planning permission is sought to demolish the existing buildings to create up to 35 residential units in blocks, some of which may be up to 6 storeys. 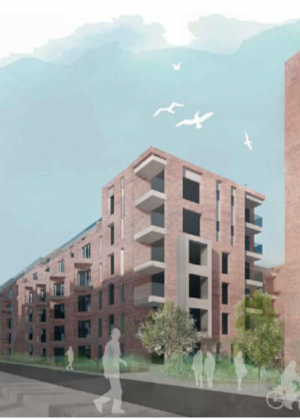 The Regency Society noted that this scheme offers no affordable housing on the grounds that all of the surplus generated by the housing element was needed to finance the re-furbishment of the tower and the new courtyard development on the car-park. Although this is disappointing it was recognised that, unlike most housing schemes, this one is designed specifically to enable improvements to the educational facilities provided by a public sector college and so the 0% affordable housing was, arguably, justifiable. 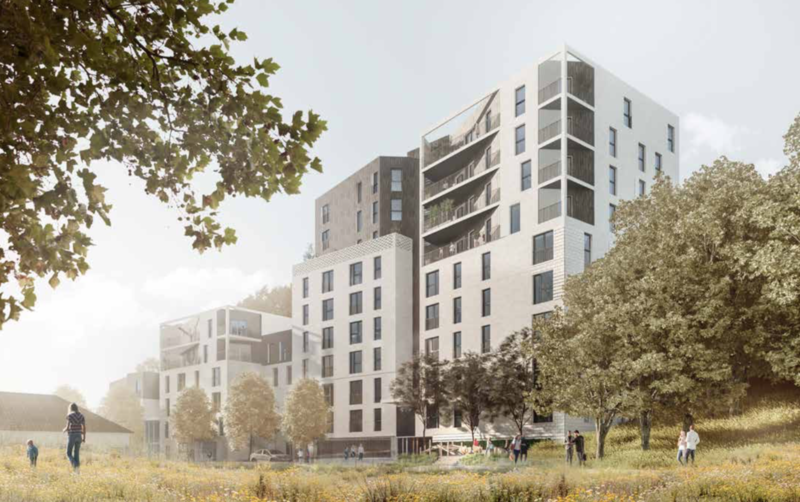 The society proposed that the college should be asked to look again at the viability of providing at least some affordable housing, taking into account not only the sites under consideration but also all of the college’s other properties elsewhere. Alternatively, or additionally, consideration could be given to allowing taller residential development on the east side of Pelham Street. 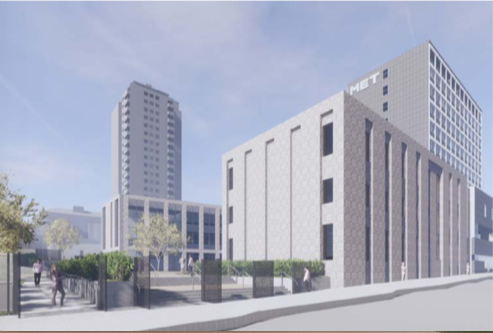 This application forms a part of a larger masterplan for the whole of the area north from and including New England House to New England Road with east and west boundaries at Elder Street and New England Street. The application site is presently a two storey block that would be demolished for a dense mixed use development for offices (3,333sqm), retail (308sqm), 208 residential units in blocks ranging from 3 to 18 storeys and landscaped open space that is intended to create pedestrian crossways to connect the surrounding areas to one another and to London Road. Elder Place will be widened and landscaped for both car and pedestrian use. 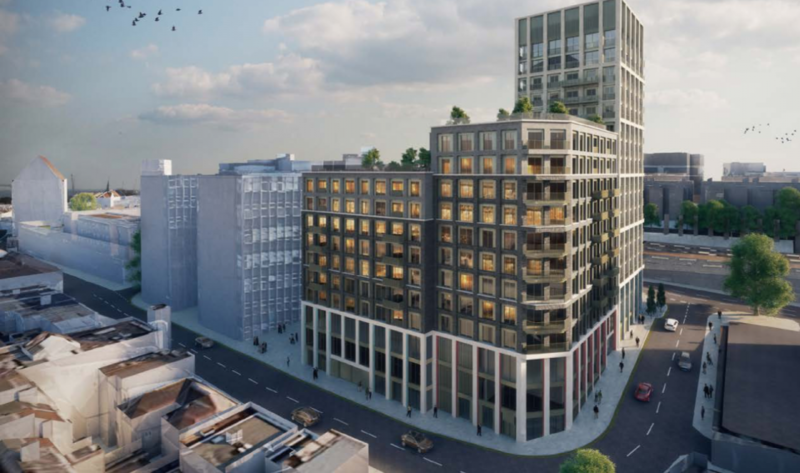 Although there is some underground car parking it is likely that the residential units will not have parking, in line with other developments in the New England Quarter. We understand that delivery bays and drop-off points will be provided so that additional traffic congestion will be minimal. 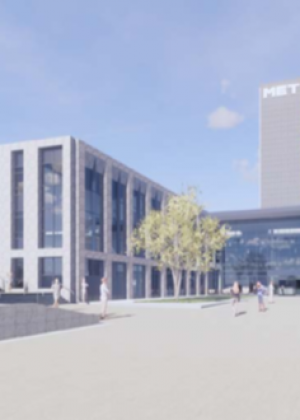 It was agreed that the building was appropriate for a brownfield site close to the main transport hub and the New England Quarter development. There was no objection to the configuration or massing of the building though the height of the tallest block was noted as a possible concern. However, it was agreed that the design was disappointing. 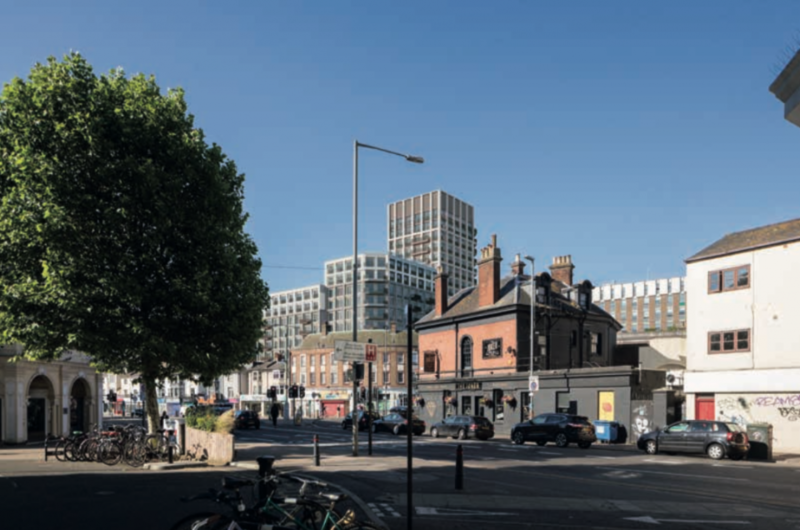 Comparison was made with the Hove's Ellen Street scheme (currently subject of an appeal) which, like this proposal involves a series of blocks of differing height and design, but with greater distinction between them that has the effect of softening the impact of the mass. 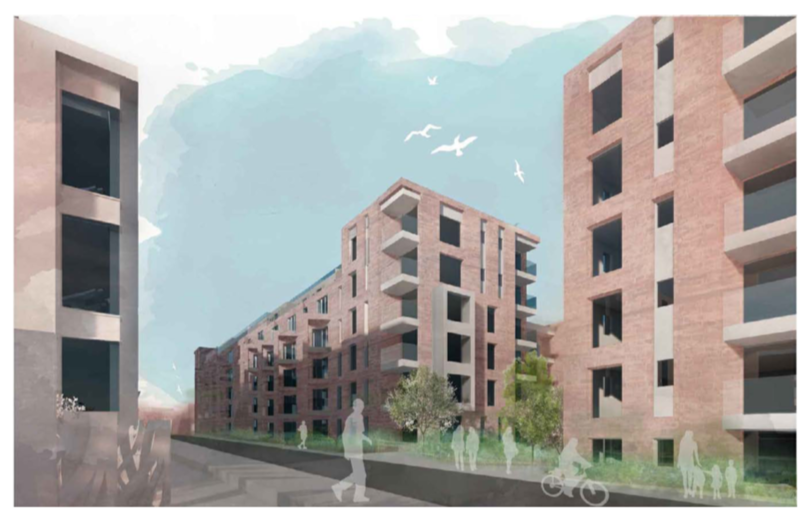 Similarly, the residential elements of the Preston barracks site development were offered for comparison. (Both of these examples can be seen in the photos above.) 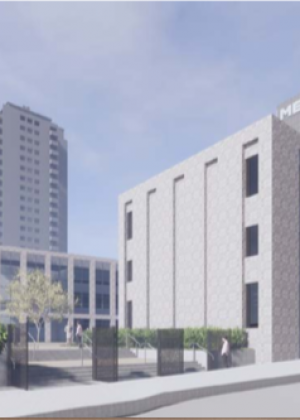 It was agreed therefore that the proposed Longley site building, as currently designed, would represent a missed opportunity to create an architecturally beneficial addition to the area in need of significant upgrade and identity and should therefore be subject to a design review. It was also agreed that the possible uses of the s.106 contributions which would result should be allocated after a meaningful consultation with the local community. The masterplan, which does not form part of the application, suggests over-development of the area. Consultation is presently taking place on plans for Vantage Point with an application likely to be submitted late in this year or so. The Regency Society will continue to review the applications and record comments on this Planning Forum page of the website. The Regency Society objects most strongly to granting this application, even temporarily. Removing the dereliction of the former Peter Pan Playground site and providing the proposed pool are both worthwhile objectives. However, it seems implausible that development on the proposed scale could produce a return on investment within five years and cover the operating deficit of the pool and still be able to pay for reinstatement at the end of the term. If the company goes into liquidation, the Council would be landed with the cost of reinstatement. The proposals are a gross overdevelopment of the site; the actual pool and its associated facilities could easily fit between Madeira Drive and the Volks Railway. A significant part of Madeira Drive would lose its seaward visibility; the few lines of vision through the serried ranks of the hutted encampment are at 45 degrees to the line of Madeira Drive and are no more than the minimum needed for circulation within it. They would become wind funnels in high winds. The proposals would generate significant extra vehicular traffic and demand for parking on Madeira Drive, when the objective should be to reduce them both. There is no recognition that Madeira Terrace is a Grade II listed building, so there is no assessment of its significance and of the adverse effect the proposals would have on its setting. There is therefore no way of assessing the supposed public benefits of the proposals against the undoubted harm which would be done to the significance of the listed building. The proposed development would be a completely incongruous neighbour to Madeira Terrace and would cut a substantial length of it off from its key relationship to the sea. 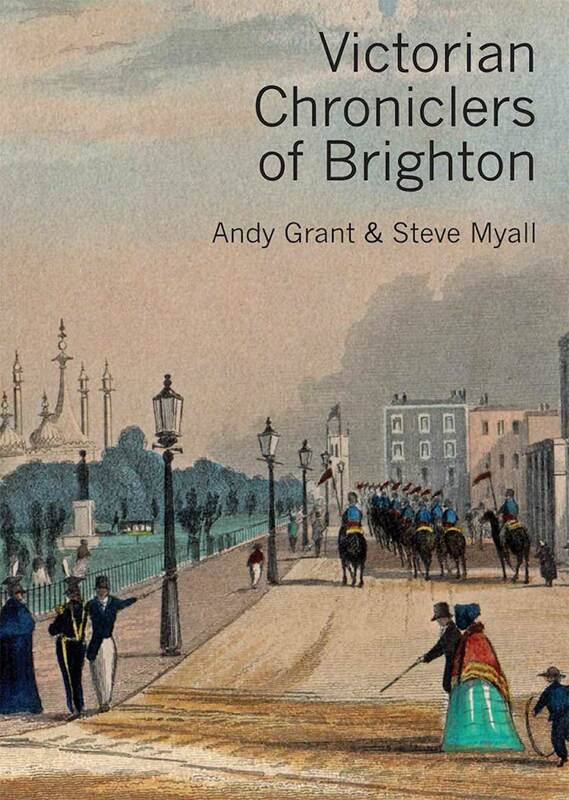 The proposals would have an adverse effect on the setting of all the other listed buildings on Madeira Drive, from the Palace Pier to the west, the only Grade II* seaside pier, to the Banjo Groin to the east. The proposals would also have an adverse effect on the unlisted heritage asset of the Volks Railway and be extremely detrimental to the character of the East Cliff Conservation Area. The adverse impact on Madeira Terrace would not just be on its significance but upon its future viability. Apart from the competition from the proposal site, nobody will want to sit in a bar or café under the terrace when their view of the sea is blocked by an eyesore. The commercial elements required as enabling development to subsidise the swimming pool would be better placed within Madeira Terrace to fund its repair and future maintenance. Permitting this egregious proposal could be fatal to hopes of saving Madeira Terrace. Contributors to the crowd-funding campaign would have every reason to feel betrayed, and any future fund-raising campaign would be starting off on the wrong foot. The Heritage Lottery Fund would be given good grounds for declining to support the rescue of Madeira Terrace.